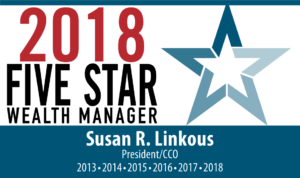 Susan R. Linkous of The Linkous Group, Ltd., received the 2018, 2017, 2016, 2015, 2014 and 2013 Phoenix Five Star Wealth Managers award in Phoenix magazine’s September issue. The select group represents less than three percent of the 10,700 wealth managers in the Phoenix area. Awards are based on 10 objective criteria associated with providing quality service to clients, such as credentials, experience, and assets under management. Survey recipients were asked to nominate wealth managers that they felt were worthy of consideration for the award. Each individual was reviewed for disciplinary actions, customer complaints and regulatory actions. Wealth managers do not pay a fee to be considered or placed on the final list. Service to clients, such as credentials, experience, and assets under management. The primary focus of NABCAP, a nationally registered 501(c)(3) nonprofit organization, is to serve the needs of the investing public by helping identify top wealth managers. 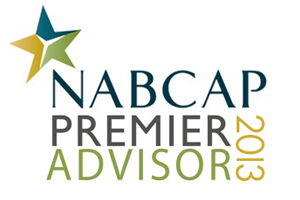 NABCAP and its Board of Directors created an unaffiliated evaluation process in which 20 categories of practice management are assessed. Advisors are invited and/or nominated to participate by submitting an online questionnaire. The multi-step verification process utilizes independent resources to assess the accuracy and truthfulness of the information submitted by participating advisory practices. NABCAP’s methodology is unique in deciphering advisorsbecause it is primarily objective, not subjective and helps add transparency for the investor’s benefit. Through our process the investing public will clearly identify practice specialties and areas of excellence. NABCAP strives to create a platform and process through which transparency becomes both the expectation and the industry standard. The investing public requires advisory practices to be in line with their needs and goals. 1. Discrimination – Including but not limited to age, gender and ethnicity. 2. Team Structure – Regardless of how your practice operates, in terms of personnel, your practice will be evaluated on their merits. 4. Revenues – The amount of sales a Financial Advisor generates is an irrelevant determining factor for who the best overall practice managers are, higher revenues do not necessarily benefit the Investor. 5. A.U.M. – A practice’s assets can be stated in multiple ways and ultimately can be misleading. To the best of NABCAP’s abilities we assure results are clear and concise.NABCAP has established a long-term contract with RPA to facilitate, administer and implement our process. We require strict assurances from RPA that all information provided by Financial Advisors is utilized solely for the purpose of educating the investing public, and not for solicitation purposes. All the information collected is the property of NABCAP. Based on business, civic and charitable contributions as selected by The Business Journal.